This idea immediately came to me. I didn't pursue any other ideas. BUT...I didn't get to shoot it till 11:00 pm on the 16th of September. Lots of things went wrong...but here it is. Such an odd photograph - here's a few things that stike me about it. Composition - mt eye is constantly drawn to the shadows, rather than the subject. The real contrat lines are hugel exaggerated by over-sharpening (check where the two apples overlap). 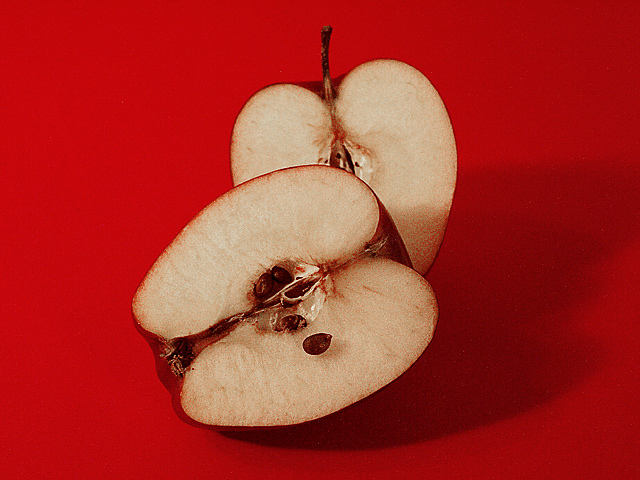 Graininess: the red field is enormously speckled, and that persists in the apples - there's no texture there at all! Low cantrast - there's no white, no black: given the muted subject, that at leasst would be neccesary to proveide some purely visulal interest. What's more annoying is that it's a prety good idea - just that it could have been executed so much better. It needs composition, texture, depth, and prbably a kore intersting view-point. especially with one seed sitting on the surfacr of the apple: imagine a low level shot of that, against a dark background, with the seed picked out by lighting from the rear and the side ... you'd have a winner there. Great Photograph, I like the background. Great idea...and nice set up. I do think the levels/white balance could of been adjusted to show more contrast. Nice shooting. Proudly hosted by Sargasso Networks. Current Server Time: 04/23/2019 07:53:40 AM EDT.